Bob Barr, who helped lead the 1998 impeachment of President Clinton, is the object of an alliance of conservative and libertarians seeking to recruit the former Georgia Republican congressman as a third-party presidential candidate. However, efforts to push a Barr candidacy were given new impetus last week when Rep. Ron Paul sent a letter to his supporters announcing plans to scale back his Republican presidential campaign and concentrate on his congressional re-election fight in Texas. Several organizers behind the draft-Barr movement were supporters of the Paul presidential campaign. Last week, Barr introduced Paul at the 35th annual Conservative Political Action Conference, calling the Texas congressman "the Constitution's best friend" and "the gold standard of conservatism" in the GOP presidential campaign. Barr's backers have also solicited support among conservative Republicans who were disappointed by last week's announcement -- made on the opening day of CPAC -- that former Massachusetts Gov. Mitt Romney was suspending his Republican presidential campaign. I actually got to hang out last week with Barr at CPAC. I jokingly blamed him for busting up a Thursday night party -- he showed up right after hotel security shut down the party for being too loud -- but got to spend some time with him Friday at Shelly's Backroom Tavern, one of the few places in DC where it is possible to smoke indoors. Barr's a cigar smoker, and he's shown here with a fine smoke and some of his many admirers. My old friend Scotty, a master chief petty officer in the U.S. Navy, just wished me 'Fair wind and God speed,' as I prepare to depart today for The Very Dangerous Foreign Country. Over 800 children have been rescued through the work and dedication of Sam Childers and his team. Upon completion of the rescues, great effort is made to reunite the children with surviving family members. If that is not possible, they join the growing family at the Children’s Village. A screenplay based on Sam's amazing life and work is already on the desk of a major Hollywood film producer. The manuscript of his autobiography is supposed to be completed and delivered to the publisher by May 1. My assignment as a researcher and editor is to make sure Sam meets that deadline. Officials at the Uganda peace talks in southern Sudan are investigating a report that Lord's Resistance Army (LRA) rebels killed dozens of people in recent attacks in the region, the Ugandan military said on Sunday. Uganda's army spokesman, Captain Paddy Ankunda, said a senior official from south Sudan's Western Equatorial state, Joseph Ngere, complained to Uganda's government about the raids. "The deputy governor has protested to Uganda that the LRA has killed dozens of people in his province," Ankunda said. A week ago, local government officials and a church group in southern Sudan said suspected LRA fighters had killed at least four people and abducted another 13 in a January 29 attack on Nyepo village, some 120 km (75 miles) from Juba. A joint report following a visit to the area by the Danish Refugee Council, local government and the church group quoted survivors of the attack as saying it was carried out between 300 to 500 armed men and women carrying rifles and machine guns. Frankly, I would have preferred to begin my career as a globetrotting foreign correspondent in the French Riviera or Monaco, but nobody's offered to pay me to go anyplace like that, and as I tried to explain to Rod Dreher a couple of years ago, I write for money. Q. Is there a two-word synonym for "ignorance"? The Drudge Report is a right-wing site that is used to drive right-wing propaganda into the large, corporate media outlets. When a story is featured at the Drudge Report, you always have to ask why, and ask what is the right's intent behind getting this story into circulation. When last I saw Andrew Breitbart -- whose professional association with Matt Drudge is not secret -- he was within an hour of closing the bar at Timberlake's in the wee hours of Sunday morning. 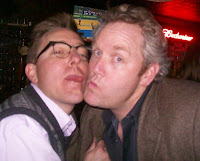 Matt Welch of Reason Magazine (left) does the classic "Facebook fake gay kiss" with Andrew Breitbart (far right). BarbieCam(TM) Photo. The Vast Right-Wing Conspiracy is more powerful than Dave Johnson suspects, though not quite so vast as to include the Associated Press. I hope to update with further insights into the fathomless ignorance of Dave Johnson, but my wife and I are expecting company for Sunday dinner, and she needs me to run to the grocery store for (right-wing) enchilada sauce. Of course, it comforts me enormously to know that Dave Johnson is "a leading participant in the progressive blogging community." While thinking exactly how to begin explaining how Dave Johnson's delusions of omniscience are coterminous with his unlimited ignorance, I decided to check up on the post-CPAC gloatfest at Ace of Spades. The morons are doing an endzone dance over the fact that their Ewok-like leader was named "Blogger of the Year." If conservatives were like liberals, then surely Jeff Goldstein would now be rallying his fellow losers in a petition drive demanding a recount, asserting anti-Semitic bias and hinting that Halliburton, Diebold and the Bavarian Illuminati were behind this unfair denial of their unalienable right to blog awards. Conservatives don't have time to blog, because their wives need enchilada sauce and friends are coming to dinner. Liberals don't have wives, enchilada sauce or friends, so they have infinite amounts of time to spend creating and consuming idiotic "content" for high-traffic timewasters like HuffPo, the intellectual equivalent of Scrabulous. Excuse me, but a late guest just arrived, but I promise after this next real-life diversion from the uber-fisking of "a leading participant in the progressive blogging community."